However, the free upgrade is not automatic. It does depend on the software version and time of purchase. 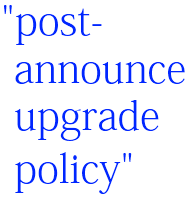 For example, your upgrade must be for the same platform, language, and edition as your previous version. So the short answer is that it may be possible – but you might wish to check with Adobe Customer Service (email, chat, or phone) in your particular case to verify that you qualify and request the materials to file an upgrade request, as the offer is only avail­able through Adobe directly. In any event, rumor has it that CS5 could be shipping on April 30th and delivered by May 7th – so if you’re thinking about doing it then that could be the remaining window! That could be unofficial and your mileage may vary, but this policy could be very helpful for a couple months longer – though you may still wish to verify you qualify in your geography with your particular details. I can confirm that my CS4 purchase of May 20, 2010 was just upgraded to CS5 for free. Don’t bother talking to customer service, they told me that the free-upgrade offer ended on April 30th. That is uninformed. Just go online and submit the online upgrade request: log in to the Adobe website and go to “get support”, click on the “orders & returns” tab, and choose the “post announce upgrades” issue type. Hi ALB, that’s great news – well done! And thank you for posting back here to update on your experience plus sharing the tip for easier online filing – very much appreciated, and congrats on the free CS5 upgrade! Does it matter where we buy it from? I found one website that said that it qualified for the upgrade but another that didn’t mention the upgrade at all. Hi Elena, according to Adobe’s eligibility requirements, you must have purchased from either Adobe directly or from an [authorized] reseller… Products bought via auction sites (like eBay which we don’t recommend), or second-hand purchases (receiving the software through a Transfer of License) aren’t eligible for a complimentary upgrade. Since CS4 is can no longer be purchased directly from Adobe, and if you’re uncertain about a particular reseller’s status, your best bet may be to get in touch to confirm if the reseller would qualify. Hey, great news… And yes, if you check those free upgrade requirements, the academic/educational versions are eligible. Nice work! Thanks so much for posting this. It was extremely helpful. I just submitted my request this evening. I would still be searching for how to do this if I hadn’t read your post. Thanks again. And using the easy method posted above by @ALB is probably your best bet for submitting the request to Adobe. Just to let anyone reading this know, I have finally managed to submit a request for this, after spending hours trying to make sense of the instructions. Even the @ALB link above just gave a 404. Eventually, I tried Internet Explorer instead of my usual Firefox and it worked! If anyone else is having problems with Adobe’s website, try a different browser – it might just work. Thanks ALB for posting the note. Like others I was trying to figure out how to request for a free CS5 upgrade from CS4 since I bought CS4 Production Premium around the same time that CS5 was announced. I just submitted my request and am hoping to hear a positive response back from Adobe.